I’ve long been fascinated with the braided hair styles seen on women in Western European figural art of the mid-to-late 14th century—particularly in French works. To my modern eyes, women did charming and oddball things with their hair. 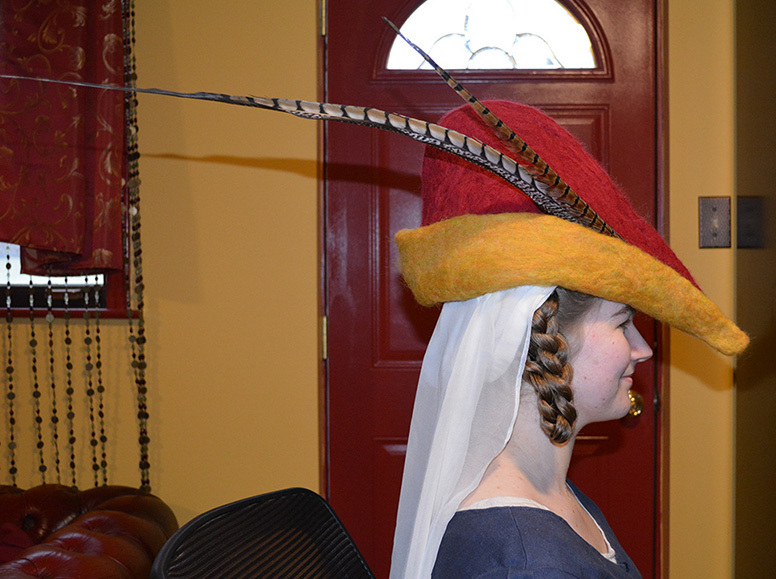 The undeniable outlandishness of these braids make them fun to recreate. I am especially enamored of the styles seen in the images below. From the blessing in a nuptial mass. Turin-Milan Hours. Museo Civico, inv. no. 47, f.87. Paris, 1380. 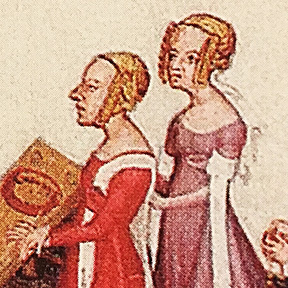 From BNF MS Français 811, f.IV. Paris, 1398. From Le Remède de Fortune, Le Dit du Lion by Guillaume de Machaut. BNF MS Français 1586, f.51. France, circa 1350. With this in mind, I invited a friend over recently to photograph the process of styling hanging braids that frame the face and wrap to the back of the head. 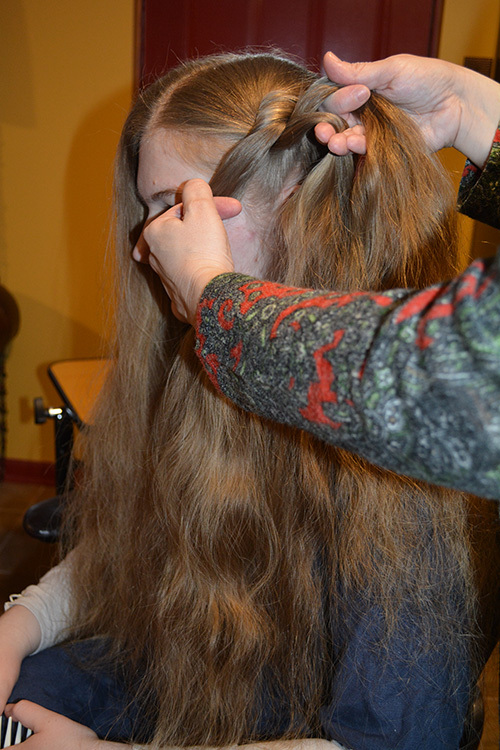 Drea has thick, lustrous, long hair, and had expressed an interest in learning the process herself. Drea, combing out her hair with a wide-toothed comb. It was a perfect opportunity to both teach her and further my own learning. 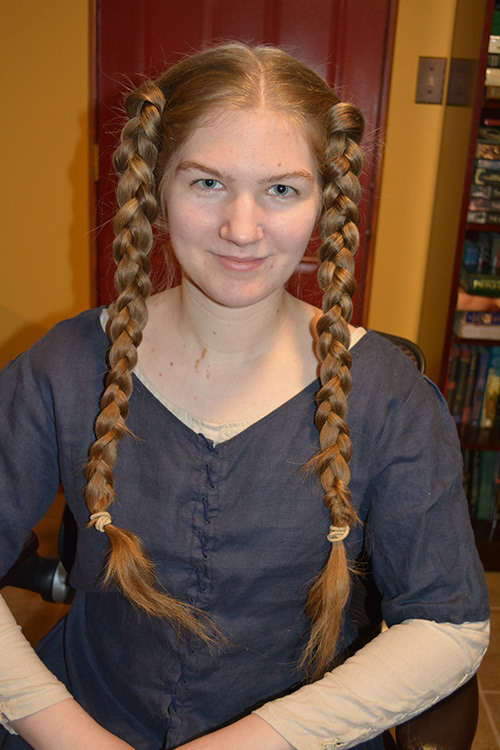 I’ve been braiding my hair in the style described for about sixteen years, but as I have thin hair that is rarely grown long enough to capture the proper appearance, I usually resort to wearing faux braids attached to a tablet-woven band. Originally, when all I had was my own hair to work with, it was my friend Charlotte Johnson who showed me how to do a simple face-framing braid arrangement. Charlotte Johnson (left) and me, posing as church donors memorialized in art. Photo from 2002 (I think?). We were so young! I started making the faux hair pieces in 2003, after seeing my dear friend Greta Nappa make one based on an extant fragment published in the Museum of London’s Dress Accessories book. I disguise my own hair by pinning it back into a low, flat bun worn under a veil. Even though I’ve long known how to arrange hair in this fashion, I’ve been lacking in the finer points of securing the braids with no use of modern bobby pins or hair ties, which I’ll go into further below. 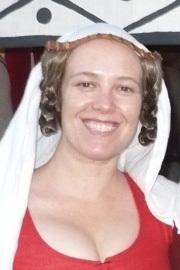 I’m wearing braids I made from extensions and sewed to a silk, table-woven band woven by Charlotte, with a linen veil. Picture taken in 2012. For this style, hair should be parted down the middle, all the way from the center of the forehead to the nape. 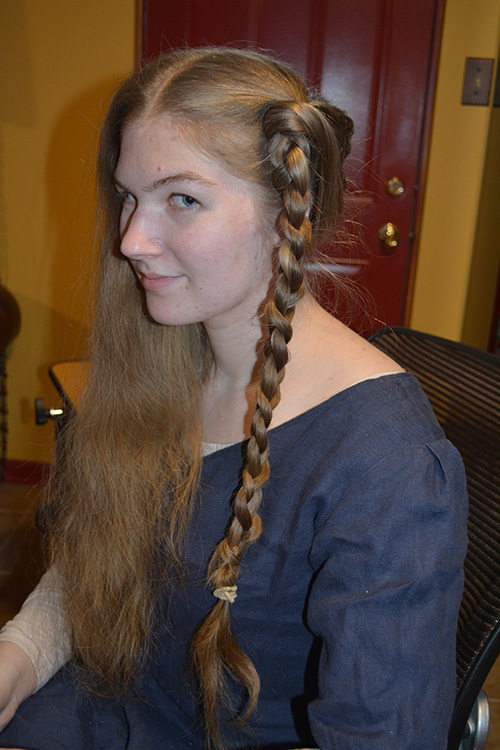 There are a number of different methods for arranging a set of 14th-century face-framing braids. For this day’s experiment, we aimed for a style that pulls all the hair on each side of the head to the temples and creates two long braids that then fold in half, get pinned to create the stiff, vertical shape, and then wrap around the back of the head. We decided to try two versions of the same style—one with plain, clean hair, and one with hair product in it. 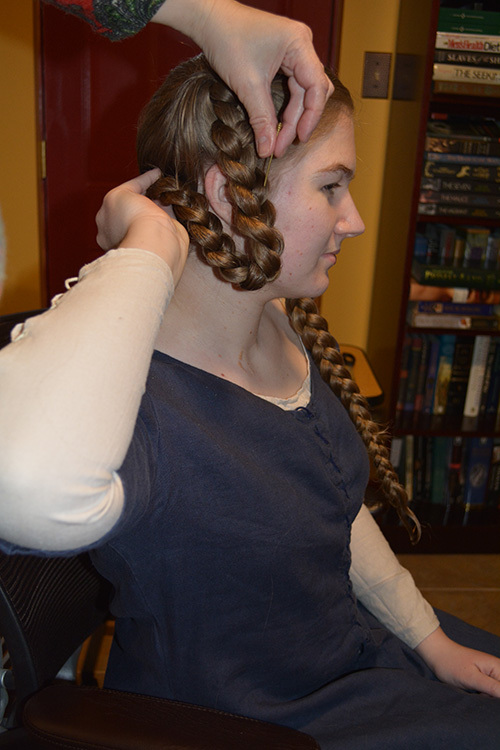 As I began to braid her freshly-washed hair, we quickly noticed how unruly and slippery it was. Drea has typical hair for a woman of European descent. If we were having this problem now, it most certainly would have also been a problem with freshly-washed hair 630 or so years ago. One braid complete. It was looking pretty fly-away. We had no choice but to use a modern hair band to secure the bottom. Both braids complete. I had this overwhelming sense that the style we were emulating would never have been done this way—with freshly-washed, untreated hair. It’s a truth, universally acknowledged, that hair is harder to style when freshly-washed and without hair products put in it. 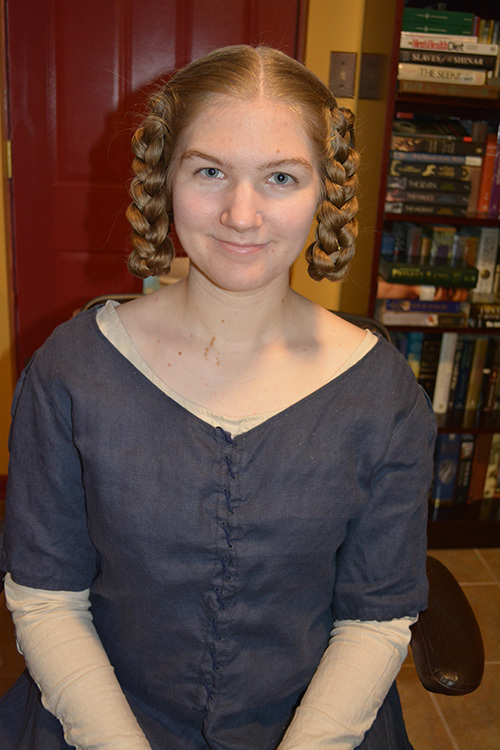 A front view of the finished ‘do. Everything was secured with pins alone. It felt and looked precarious. Back view of the hairstyle. A stiff wind would have made it come tumbling down. Side view of the hairstyle. The brass pins, at least, did a great job pinioning the braid to itself to create the vertical shape. 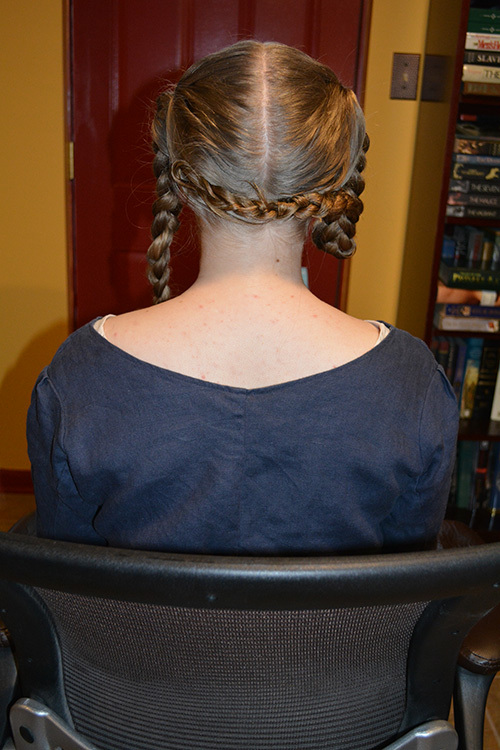 We had completed the first half of our experiment: braiding and arranging hair without any product in it. I experienced the challenges untreated hair brought to the process. As you can see in the photos above, it’s passably okay, but doesn’t really look as sleek and contained as imagery from the 14th century portrays it to be. I couldn’t imagine Drea going about an active day without the braids slipping free and falling apart. I had given this some thought leading up to Drea’s visit, in fact. 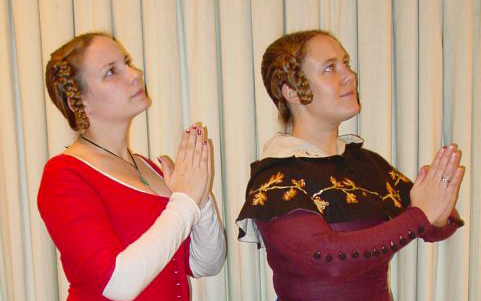 I pulled out The Compleat Anachronist issues #144 and 145, “Unveiling the Truth: Medieval Women’s Hairstyles” by Barbara Segal and read with interest her hypothesis that flax seed gel could have been used to optimize long hair’s texture when braiding during the 14th century. 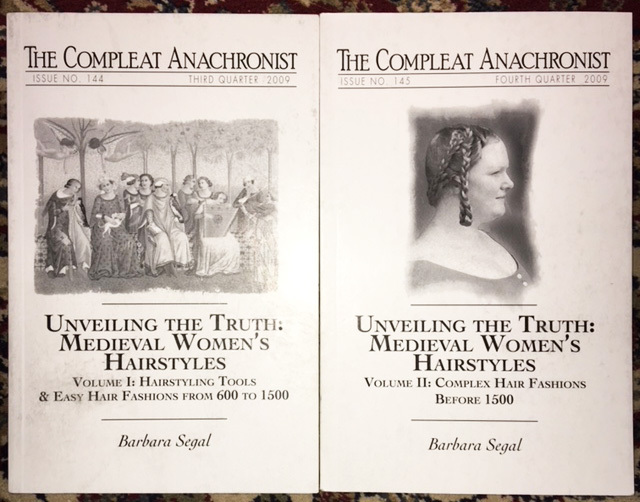 The Compleat Anachronist, issues 144 and 145, by Barbara Segal. 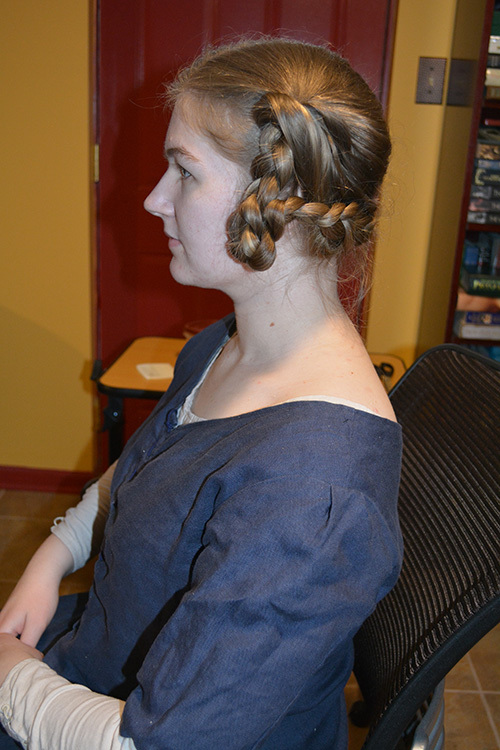 I recommend them to anyone interested in historical hairstyling. 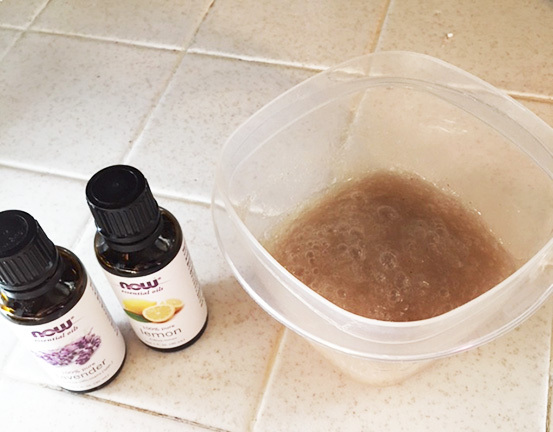 Flax seed gel is incredibly easy and fast to make, and YouTube has a number of instructional videos. While the author did not provide evidence from before the 16th century to support the concept, it is certainly a rather common-sense and reasonable one, and I was willing to experiment. Before Drea arrived, I made some gel, enhancing it with essential lemon and lavender oils for scent. I have affectionately taken to calling it “vegan snot”. 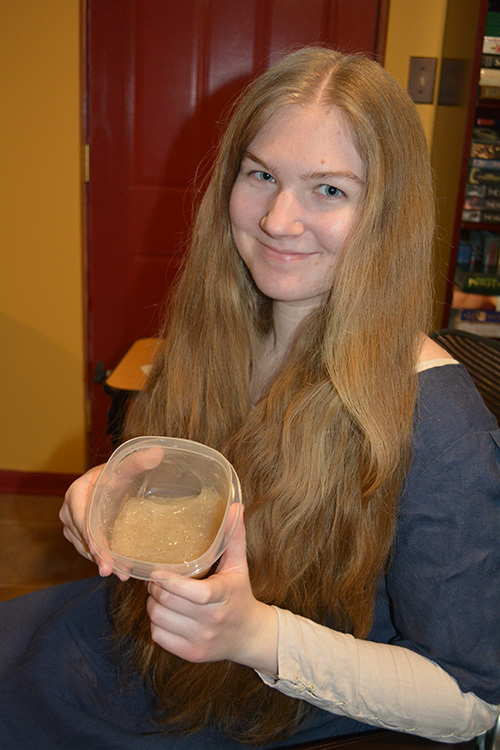 Finished homemade flax seed gel, along with essential oils to give it a pleasant scent. This stuff is not going to win any beauty contests on appearance. Yuck! But it sure smelled wonderful. Drea holding the flax seed gel (VEGAN SNOT!!). This delightfully unappetizing wonder-gel will store for a month or two in the refrigerator. Now it was time to try the hairstyle with flax seed gel. Getting it into her hair took a while. Patience and a wide-toothed comb did the trick. When the hair felt slightly tacky to the touch and there were no more slippery or fly-away sections, I deemed it ready for braiding. When you have all the hair gathered into your hand to begin the braid, I find it easiest to twist the hair so that the braid will be angled to face outward in the same plane as the face. We see this in the art of the time as well. 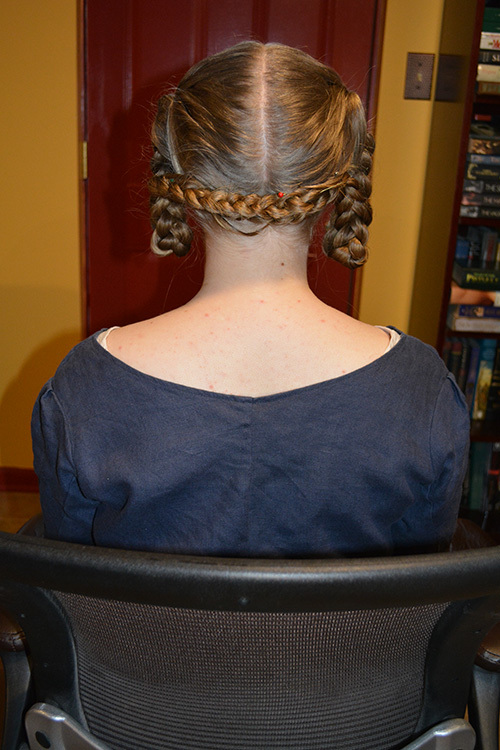 Hair has been gathered to the temples, twisted forward—or counter-clockwise in this view—and I’ve begun the braid. Already, the difference in control was amazing, thanks to the gel. 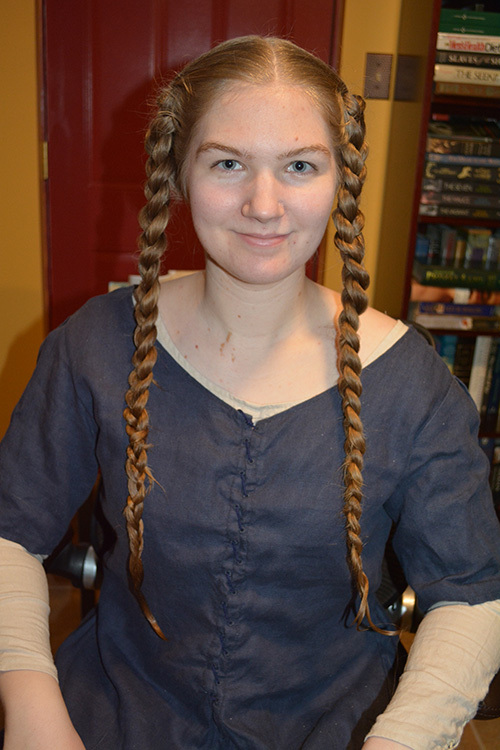 I braided the hair as tightly as I could manage, which was considerably more tight than I could achieve with plain, untreated hair. The gelled braid was infinitely sleeker and easier to control. The hair gel was a complete success. Thanks to it, I did not need any hair bands or ties to hold her braids in place while fiddling with other things. Both braids complete and holding together with nothing securing them aside from flax seed gel. Already this product was worth the effort of making it. 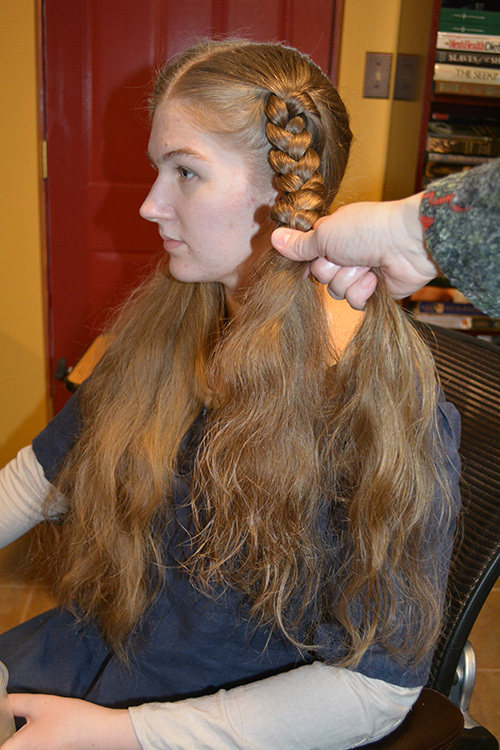 Next, I folded a braid in half, so that the bottom portion of the braid was bent toward the back of the head. I used a sturdy brass pin to hold the folded pieces together, no gaps showing between them. 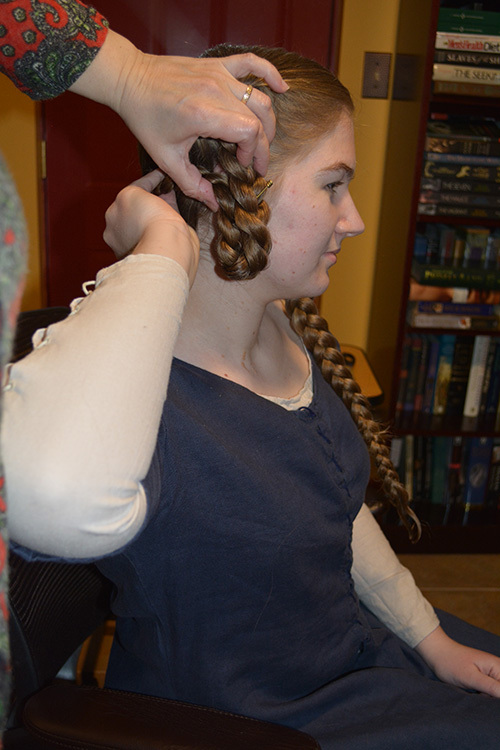 The bent portion of the braid only proceeded about halfway up the length before veering off to the back of the head. Using more straight pins, I tucked the gelled ends under and secured the end of the braid on the far side of Drea’s head. Drea assists with the folding of the braid. Some 14th-century braids bend exactly like this and do not get pinned together before proceeding to the back of the head. For an example, see the Marie de France bust at the Metropolitan Museum of Art in New York City. But that’s not the style we were attempting. See how the braid is a solid piece, no rounded loops? I wiggled the pin between both folded portions to hold them firmly together. 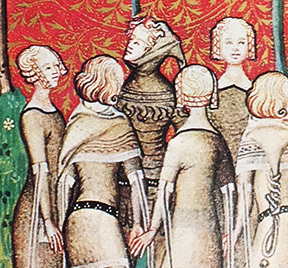 The iconic silhouette of 14th-century braids was coming together. The pin should be out of sight, nestled in the middle of both portions of folded braid. With the gel, wrapping the hair and securing it on the back of the head with pins alone was an easy process. I repeated these steps on the other side. I loved how manageable the hair became, once it contained gel. The slipperiness and fly-away concerns were solved. It was a dream to work with. I’m convinced that most women either hardly ever washed their hair in order to let the natural oils in the scalp develop and spread throughout the hair, or they used a hair gel, like the flax seed-based one I used. Perhaps they did a combination of both things. 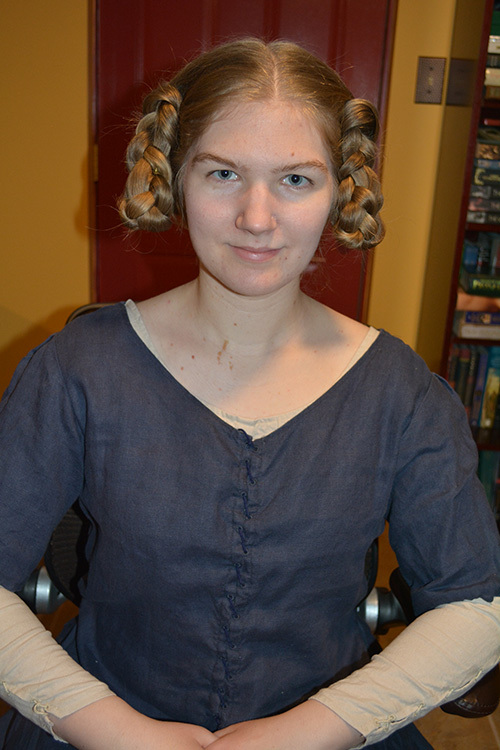 The finished hairstyle, from the front. It looks worlds better than the un-gelled version does. 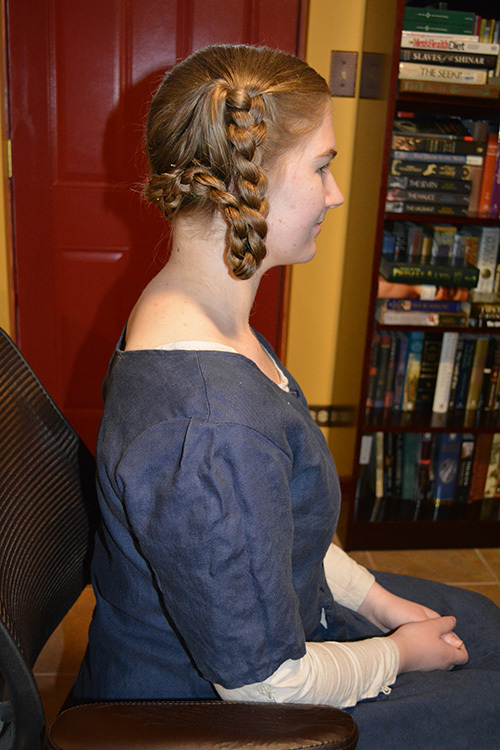 Side view of the finished hairstyle. Note the ears are covered for the most part. You will see this in the figural art as well. 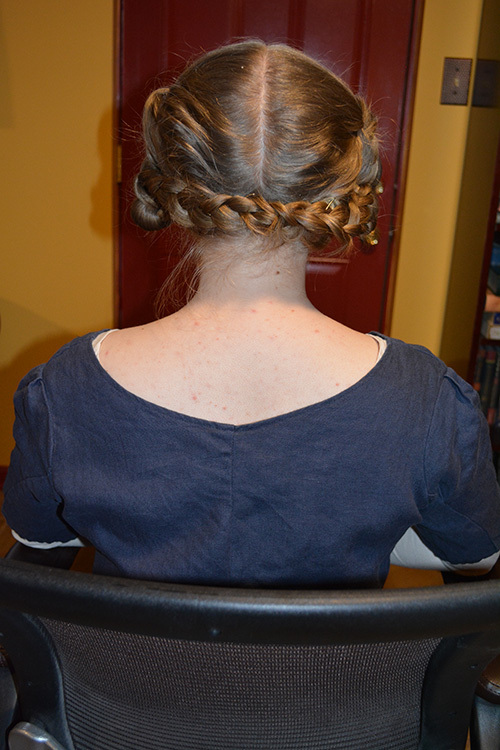 Back view of the finished hairstyle. With the gel providing some stickiness and stiffness, I have much more confidence that the pinned arrangement would not fall out over the course of a normal day’s activity. The braids look lovely when framed with a simple silk veil. I put a Birgitta-style linen cap on her first, then pinned the veil to it. I only had a few brass pins up to the task on the day of this experiment. 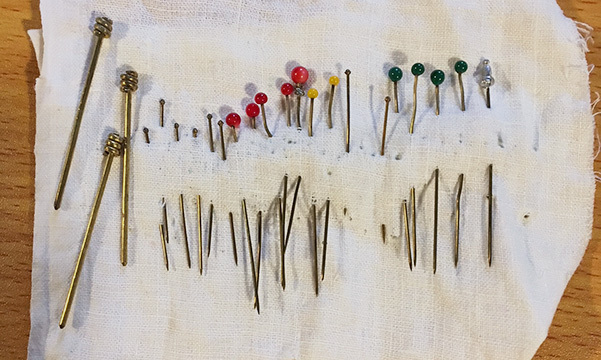 Through the years I’d accumulated (and lost) lots of brass pins, but for the most part, they weren’t sturdy enough for holding thick braids in place. My brass pin collection. Much used and abused through the years in service to pinning my veil to my table-woven band. The thin ones were insufficient to the task at hand. I could only use the butch ones on the left for pinning the hanging braids. I got away with using the thin ones when securing the braids to the back of her head, but it was iffy because of their thin and sharp form. Most of these are better suited to pinning veils. Later, I found a maker on Etsy who made me a bunch of custom-sized pins. 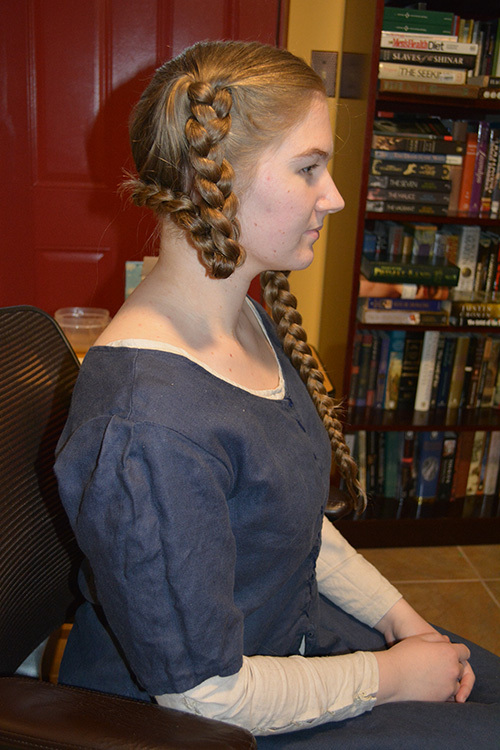 I asked them to make the points a bit dull since this is for hair (which sits close to tender scalps), not fabric. I ordered them in 2-inch and 3-inch sizes. 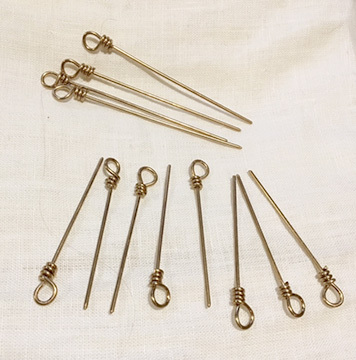 Brass pins, custom-made to lengths of 2″ and 3″ by MinionMakers on Etsy. If you want custom-made hair pins, please do get in touch with them. Let’s support the small businesses out there. If I order again, I will likely ask that they make the loops at the heads of the pins smaller to reduce their visual profile and come more in line with extant examples. 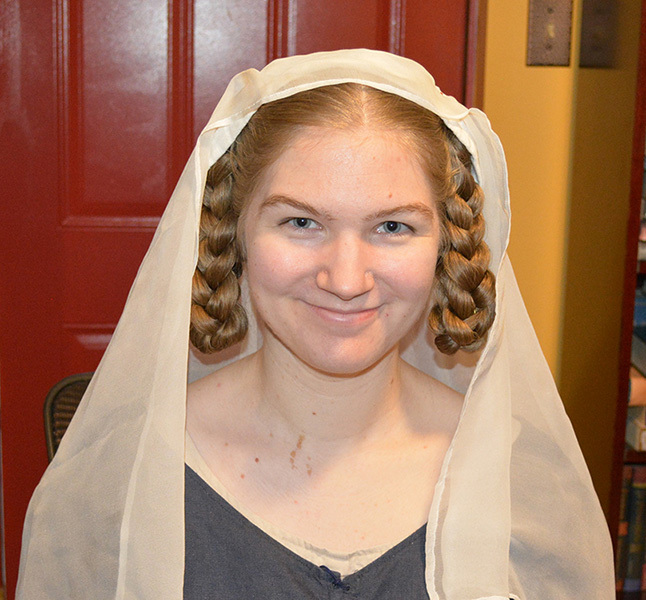 While my own hair may never make as full an appearance as Drea’s can, I am now armed with good brass pins and a bag of flax seeds, and can produce a solid 14th-century hairstyle upon command without using anything modern. This was a fun learning and teaching experience for both of us. I look forward to getting my hands on more heads of long, full hair for further experimentation. Lovely! 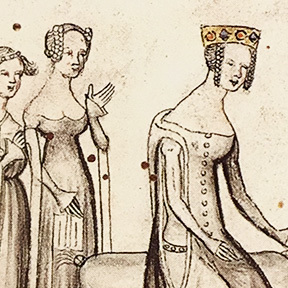 I’ve often wondered how women achieved the hairstyles of the time. Thank you. I frequently remind myself to return to Occam’s Razor — go with the simplest approach that gets good results. So impressive! 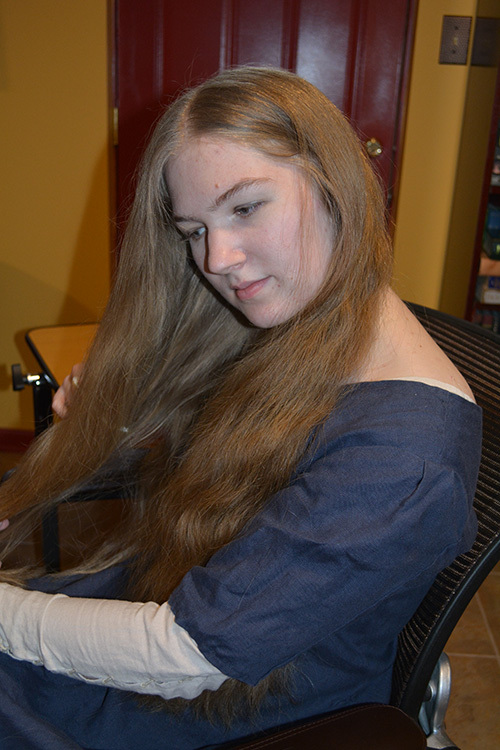 I have long hair and love to find historic hairstyles. Now I have something to try besides a single braid down the back for my ren wear. Thank you!